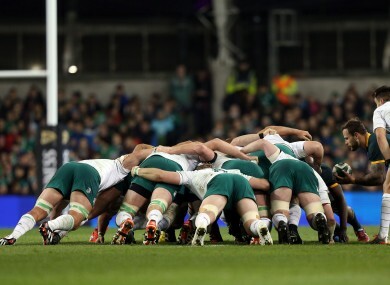 Ireland's scrum creaked against the Boks last weekend. IRELAND’S PLAYERS CERTAINLY enjoyed victory over the second best team in the world last weekend, but for the tight forwards it was a bittersweet feeling. Essentially, South Africa won the scrum battle in Dublin. As in any sector of play, the Irish pack had their positive moments, but overall Greg Feek and his charges were left unhappy with their efforts. Jack McGrath was on the receiving end of several penalty decisions from referee Romain Poite, although Ireland captain Paul O’Connell asked the Frenchman to watch a perceived early drive by the Springboks at least twice. Feek, Ireland’s scrum coach, had an interesting perspective on proceedings, acknowledging that his side’s preparation had left them somewhat slow to react to actual events on the pitch. You’ve got to take the win, but you’re also honest in terms of how it went,” says Feek, “and from that persepctive we prepared in a certain way. “I put a lot of emphasis on being disciplined and not giving away cheap penalties, keeping the scrum up, not pushing before the ball comes in. “Maybe we took the focus off exactly what was coming at us a little bit. Those things can be corrected, we want to correct them and no better test than to go against the Georgians. “I put a lot of preparation into discipline and it’s a big part of what we did last year,” continued Feek when promoted to explain further. “Maybe we focused on that a little bit too much. “So we were focusing on not trying to give those penalties away, and not focusing on what was actually coming at us. You learn and take things out of it. I’ve got the players to fix that and the systems to fix that. The Georgians, who have included scrummaging specialists like Davit Kubriashvili [Stade Français], Levan Chilachava [Toulon], Mikheil Nariashvili [Montpellier] and Zurab Zhvania [Stade Français] in their squad this month, will firmly test Ireland’s competence. With that in mind, Feek hints that this may not be the game in which to give the somewhat unproven Rodney Ah You or Stephen Archer an Ireland start at tighthead prop. There’s never an easy day at the office for the forwards and we need to understand that from how we prepare, what we talked about last week and also who we select,” says the Kiwi. On the loosehead side, Munster’s Dave Kilcoyne will feel he has proven himself to the extent that a start has been earned. McGrath may be rested before re-entering the fray againt the Wallabies in two weekends’ time. Mike Ross put in a 73-minute shift at tighthead against the Boks following a month without playing, and looks very likely to start again on Sunday. Feek was pleased to see his first-choice number three back in action, and feels there is more to come. “I think the way the game went, it was a bit stop-starty, there was a bit of kicking, that actually suited Rossy in the end. Obviously at scrum time, we weren’t happy a lot of the time, but I know with his history that he will only get better. Tadhg Furlong has been involved at Carton House again this week, building valuable experience within those famous high standards of Joe Schmidt’s camp. The 21-year-old Wexford tighthead remains a way off a first Ireland cap, but Feek agrees that it’s positive for the Leinster man to be involved. It’s been good. You obviously always look at positives when you’ve had injuries and obviously Nathan White is injured and Marty [Moore]‘s out, but it’s given these guys a chance to come in, do some live scrummaging, see how the whole thing works. Email “Ireland's scrum out to right their Boks wrongs against Georgians”. Feedback on “Ireland's scrum out to right their Boks wrongs against Georgians”.